Kilimanjaro, the highest mountain in Africa and fourth highest of the Seven Summits, is considered the tallest freestanding mountain in the world, rising 15,100 feet (4,600 meters) from base to summit. Kilimanjaro is also the most prominent mountain in Africa. Prominence: 19,308 feet (5,885 meters); Most prominent mountain in Africa. First Ascent: Hans Meyer (Germany), Yoanas Kinyala Lauwo (Tanzania), and Ludwig Purtscheller (Austria) on October 5, 1889. The meaning and origin of the name Kilimanjaro are unknown. 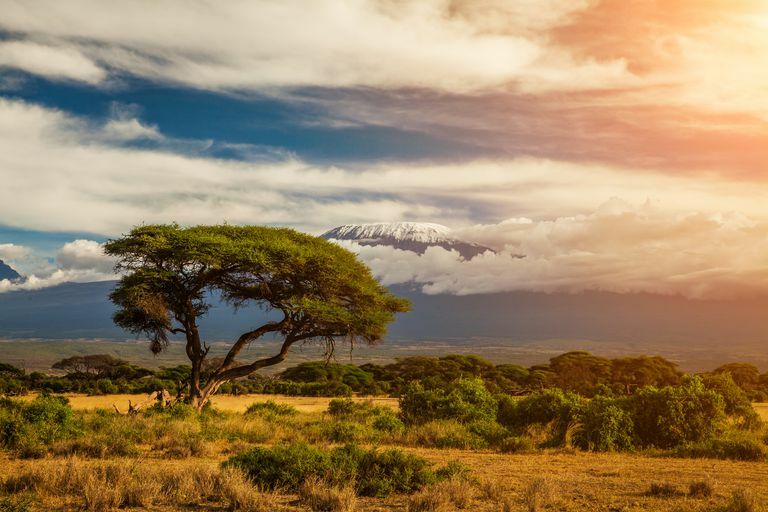 The name is thought to be a combination of the Swahili word Kilima, meaning “mountain,” and the KiChagga word Njaro, loosely translated as “whiteness,” giving the name White Mountain. The name Kibo in KiChagga means “spotted” and refers to rocks seen on snowfields. The name Uhuru translates as “freedom,” a name given to commemorate Tanzanian independence from Great Britain in 1961. Kilimanjaro is a giant stratovolcano that began forming a million years ago when lava spilled from the Rift Valley zone. The mountain was built by successive lava flows. Two of its three peaks—Mawenzi and Shira—are extinct while Kibo, the highest peak is dormant and could erupt again. The last major eruption was 360,000 years ago, while the most recent activity was only 200 years ago. Kilimanjaro has 2.2 square kilometers of glacial ice and is losing it quickly due to global warming. The glaciers have shrunk 82 percent since 1912 and declined 33 percent since 1989. It may be ice-free within 20 years, dramatically affecting local drinking water, crop irrigation, and hydroelectric power. Kilimanjaro lies within the 756-square-kilometer Kilimanjaro National Park, a UNESCO World Heritage Site, and is one of the few places on earth that encompasses every ecological life zone including tropical jungle, savannah, and desert to montane forests, subalpine plants, and the alpine zone above timberline. Climbing Kilimanjaro requires no technical climbing or mountaineering experience. It is just a long trek from base to summit. Some parts of the mountain require basic scrambling skills (i.e. the Barranco Wall), but in general, anyone with decent fitness can climb Kilimanjaro. The challenge is the mountain’s high elevation. As high mountains go, the routes on Mount Kilimanjaro have rapid ascent profiles. Acclimatization opportunities are relatively poor, and therefore the incidence of acute mountain sickness (AMS) is rather high. Some studies show that up to 75 percent of trekkers on summit night suffer from mild and moderate forms of AMS. Deaths on Kilimanjaro are often due to improper acclimatization and the onset of severe altitude sickness rather than falls. Kilimanjaro is not a peak you can climb on your own. It is mandatory to climb with a licensed guide and have porters carry your equipment. This sustains the local economy and allows local people to reap the rewards of tourism. The fastest ascent of Kilimanjaro is a record that is broken time and again. As of 2017, the record is held by Swiss mountain runner Karl Egloff at 4 hours and 56 minutes, and including the descent, his total round trip was 6 hours, 42 minutes, and 24 seconds. 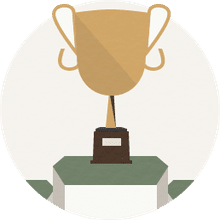 The previous record was held by Spanish mountain runner Kilian Jornet, who reached the summit in 5 hours, 23 minutes and 50 seconds in 2010; beating the previous ascent record held by Kazakh mountain runner Andrew Puchinin by one minute. After a short break at the summit, Jornet then ran back down the mountain at a blistering speed of 1:41 to clock a total ascent and descent record of 7 hours and 14 minutes.Tanzanian guide and mountain runner Simon Mtuy owns the record for an unaided climb, carrying his own food, water, and clothing, at a round trip of 9 hours and 19 minutes in 2006. The youngest person to climb Kilimanjaro is Keats Boyd, an American who trekked up Uhuru Peak at age 7. What's impressive is that he managed to dodge the 10-year-old minimum age limit! The record for the oldest climber is constantly surpassed. Angela Vorobeva holds it as of early 2017, reaching the peak at the age of 86 years, 267 days, and having survived the Siege of Leningrad in 1944. For a while, the record was held by 85-year-old Swiss-Canadian Martin Kafer who reached the top of Uhuru Peak in 2012 along with his wife Esther, who became the oldest women to climb Kilimanjaro at age 84. However, both of their records have now fallen. The allure of Kilimanjaro has led other incredible ascents. In 2011, paraplegic Chris Waddell used a hand-cycle to trek to the summit. Paralyzed from the waist down, Waddell took six and half days and 528,000 revolutions of his custom-built wheels to reach the Roof of Africa. This amazing achievement was followed in 2012 by quadruple amputee Kyle Maynard, who took 10 days to crawl on the stumps of his arms and legs to the top. Mount Meru, a 14,980-foot volcanic cone, lies 45 miles west of Kilimanjaro. It is an active volcano; has a snowcap; lies in Arusha National Park; and is often climbed as a training peak for Kilimanjaro. Six official routes climb to Kilimanjaro’s summit. The Lemosho Route and Shira Route start on the western side of the mountain. The Machame Route and Umbwe Route begin to the southwest and join hikers on the Lemosho and Shira Routes on day 2. The Marangu Route also called the “Coca-Cola route,” starts southeast of the mountain and is the only route with hut accommodations for the entire duration of the trek. It also has an unfounded reputation for being the easiest route but in fact has one of the lowest summit success rates since its route profile is rapid, and its final summit slopes are steep. Rongai, the last route, begins from the remote northeast side of Kilimanjaro and is flatter, drier, and less busy than the southern and western routes. There are variations on these routes. For example, the Northern Circuit is a popular alternative for trekkers on the Lemosho Route, and the Western Breach provides a challenging climb from a crater camp for trekkers approaching from the west or southwest. The Southern passage via Barafu camp and Stellar Point (used by trekkers on the Lemosho, Shira, Machame and Umbwe Routes). The Eastern passage via Gilman’s Point (used by the Marangu, Rongai, and Northern Circuit trekkers). The technical Western Breach, which is mostly used by experienced trekkers who approach from the western and southern routes. Thanks to Mark Whitman with Climb Kilimanjaro Guide for giving some of the facts in this article.